The DingoTone Big Sky Drive (“BSD”) pedal is a superb transparent overdrive that uses vintage specification Germanium to get complex and full overdrive tones. It is one of the most flexible overdrive pedals you will ever use. 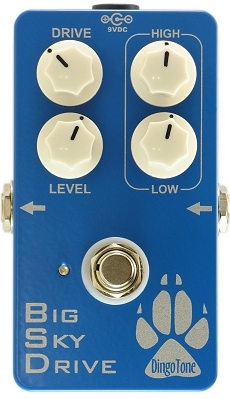 The BSD will let your distinct tone come through unharmed – and we give a seven day satisfaction guarantee to prove it! Keep the Drive control at minimum for a very light overdrive, bring it up through “noon” for some crunchy overdrive that cuts right through, or crank it up to get an edgy, dirty even fuzzy tone. And the tone stack allows you to dial in anything you need.